Optic Gaming have announced that they have released their Indian CS:GO lineup. The decision was made after the player Nikhil “Forsaken” Kumawat was found cheating at the eXTREMELANDS Zowie Asia 2018 tournament. In the aftermath there has been much discussion about anti-cheat measures at LAN events and how this incident will impact support for developing Counter-Strike regions. One question that hasn’t received as much attention is how a player with a checkered past was able to get on the OpTic team. 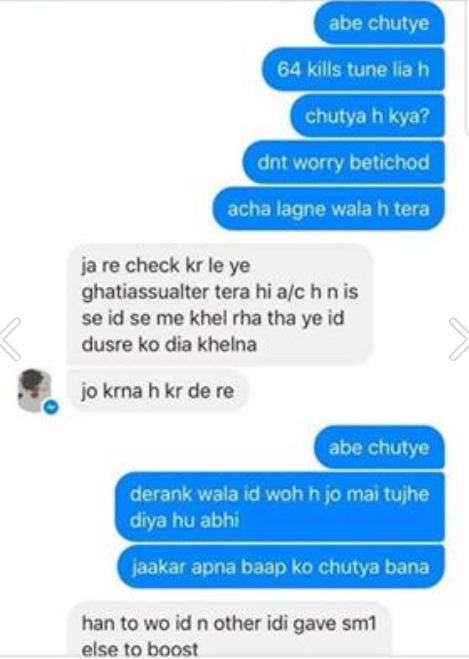 Our investigation shows that not only was Kumawat a player that most in his scene knew to be an habitual cheater but also that even members of OpTic India had tried to have him removed from the team in regards to their suspicions. India is not considered a prominent location for esports yet its CS scene has been growing since the introduction of SoStronk, a pugging service similar to FACEIT strictly for people in and around India to play pick-up games in a supposedly cheat free environment. Unsurprisingly Forsaken had been climbing their player ladder with a plethora of accusations of cheating from various players including accomplished international players like Hansel “bntet” Ferdinand who is currently playing for Chinese team TyLoo. We spoke with several professional players based in India who asked to remain anonymous for the purposes of this report and they all stated that Kumawat’s performance alone should have raised questions. First, while not hard evidence in and of itself, he came pretty much out of nowhere with no traceable pedigree or experience within the game at all. Although this is common for low tier teams to gamble on someone Kumawat immediately established himself as a star player and delivered consistently. “In his first official game he played with a team called Shooting Monkeys he dropped fifty plus frags” one professional recalled. Secondly, the same players said that at no point did he ever struggle to establish himself among his fellow players despite consistently moving up through the talent pool. He was average or above average transferring his online playstyle to LAN with no issues. Even his worst match statistics were still respectable and by all accounts the player looked like a phenom, someone who literally picked up the game and had mastered it within a year. Even if you take into consideration the standard of opposition, within the Asian region, Kumawat’s statistics make him comparable to a S1mple or a Device, all while having a headshot percentage that rivalled ScreaM at his best. This data point was verified by Counter-Strike analytics platform Sixteenzero.net who pointed out just how damaging the statistics were with hindsight. Kumawat had an unbelievably high clutch rate in 1v2s, had reaction times that were ahead of some of the best players in the world, and had an engagement accuracy that was greater than any player on Team Liquid, Na’Vi or the number one team in the world Astralis. All the while he barely threw utility at all, most likely because he had never mastered its usage and this is something that cannot be cheated. It’s no wonder that so many Asian players that had to go up against him had complained. In the aftermath of the ban, it quickly became public knowledge that the player had been investigated by the Esports Integrity Coalition over the matter of a VAC banned account that he had been associated with. He maintained he traded his account in September of 2016 to cover college expenses. While this is plausible with the delayed banning system implemented by Valve Anti-Cheat (VAC) it’s not possible to know when the account had the cheats used on it. Also, a check on vacbanned.com reveals a ban recorded one month prior to selling the account in another game. This isn’t a CS:GO ban but it shows that the account had been exposed to cheats for other titles while it was still under the control of Kumawat. After showing a proof of sale to the ESIC investigatory panel he was hit with a six month ban, reduced from two years, for violating Valve’s terms of service. This was only the tip of the iceberg though. 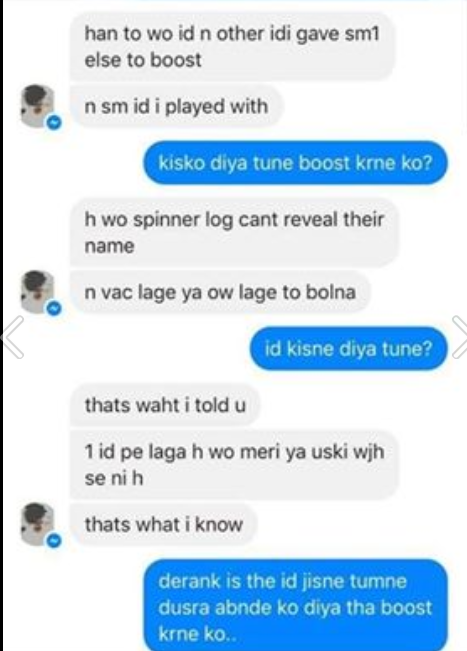 What the ESIC investigation didn’t uncover was that, according to several players we interviewed, Kumawat was known to boost accounts and sell them consistently. Obviously as someone with no experience playing the game the methods he used to boost the accounts involved cheats and some of the accounts he would sell did go on to be VAC banned. “The only thing he was famous for [prior to joining OpTic] was boosting IDs using hacks” one player said. 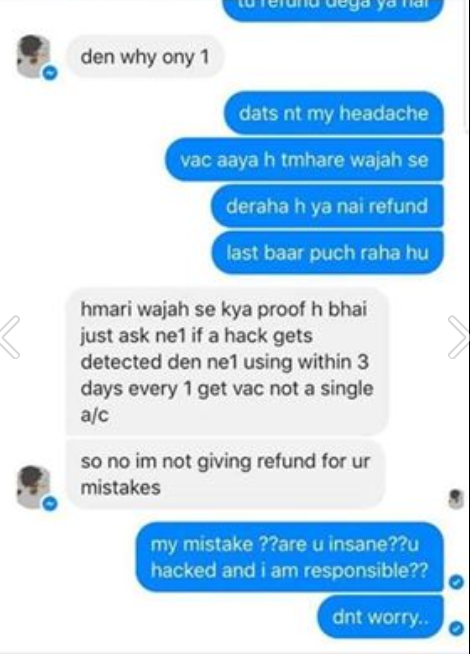 “He was boosting IDs in 2016 and a few of them did get VAC’d” another recalled. 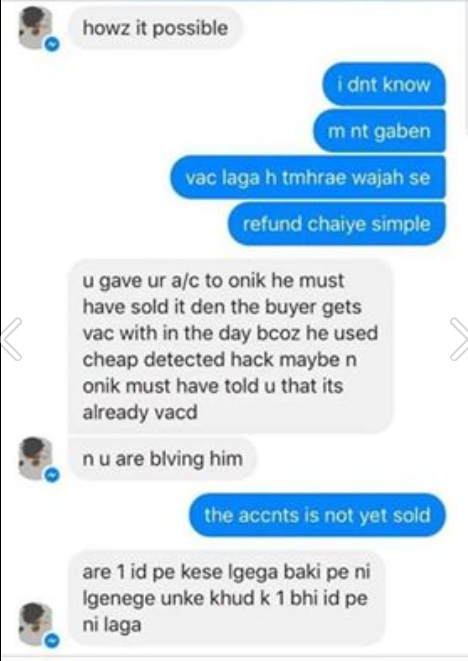 Below is evidence of a conversation between Kumawat and a disgruntled customer whose account got VAC banned after he handed it over for boosting. These chat logs were shared with other players in the scene in a bid to expose Kumawat’s dishonesty. In addition to this, he would allegedly accept money to carry accounts to higher Matchmaking ranks or SoStronk ladders. 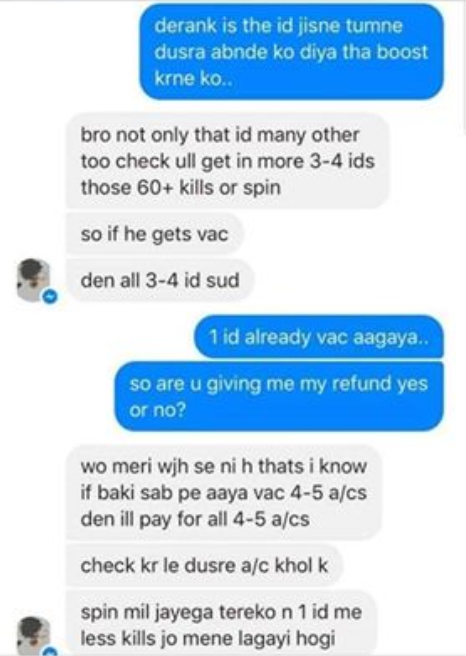 According to every player we spoke with, he was one of the most infamous boosters in India and he left a trail of VAC banned accounts in his wake. One source there were approximately fifteen accounts banned within a couple of weeks of him boosting them making a big group of people angry about his “services” and wanting their money back. While the ESIC investigation had seemingly fallen short, excusable given the difficulty in uncovering evidence in a region that operates outside of the mainstream esports world, they were not the only company to give Kumawat a clean review. SoStronk admins themselves had vouched for the player when other professionals had voiced their concerns. Prior to and after his selection by OpTic Gaming, multiple admins posted vehement defences of the player on the Facebook groups used to manage activity for the SoStronk system. With no-one in authority willing to believe that the player was a cheater, the teams in India collaborated to try and keep Forsaken out of teams. 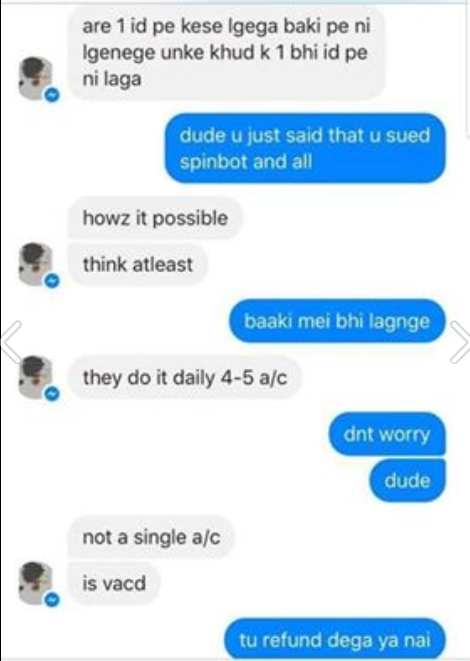 We were told that they were blacklisting Forsaken from attending Indian tournaments and playing in online cups with any prize pools. The players were tired of him being allowed to cheat his way to the top while the rest of the scene struggled to make their way up. The clips that were coming out during his matches showed him blatantly cheating in both Matchmaking and SoStronk games. The players who came forward with these examples said that Kumawat was more blatant in practice matches and that he “did not care about getting banned” claiming that the rules toward accounts and ban evasion were loosely held up on SoStronk. This was supported as many posts about other notorious cheaters in the scene were making new accounts with the same name on the site and climbing ladders again to get to the top. It seems impossible that OpTic management did not do any cursory investigative work and did not discover all of these issues with the player ahead of the trials through which he was selected. Sabyasachi “Antidote” Bose was one player who had kicked Kumawat for cheating in the past. They told us that they had reached out to OpTic to inform them of this but were not listened to. The OpTic India coach, later turned in-game leader, Lukas “yb” Gröning made a comment and ultimatum to Optic management: either you kick him or I will not play with the team anymore. His protests were supposedly satisfied after Kumawat demonstrated he had a faulty mouse and that the crosshair jumping in clips was being caused by that. They told us that they had reached out to OpTic to inform them of this but were not listened to. The OpTic India coach, later turned in-game leader, Lukas “yb” Gröning made a comment and ultimatum to Optic management: either you kick him or I will not play with the team anymore. Despite all of this evidence being shared with OpTic and even members of his own team voicing their objections to his continued presence on the roster, Kumawat dodged several bullets prior to that fateful incident at eXTREMELANDS Zowie Asia 2018. It seemed that the team manager, Akshay “aKS^” Singh, had repeatedly dismissed any of the claims made against Kumawat and refused to entertain any investigation into or sanctions against the player. Singh was a former teammate of Kumawat’s from a previous line-up. While it is clear that the players couldn’t have known for certain the weight of evidence suggests that it is impossible they could have not observed the allegations against their teammate and colleague. Principally, the due diligence undertaken by OpTic Gaming management around the acquisition of this player seems to be close to none. So, while with this knowledge dropping the entire roster might very well be the right move to do it’s also an unavoidable truth that it was the organisation themselves that allowed an established cheater and account seller to represent their brand. Editor’s note: In a previous version of this article it was erroneously stated that Rishab “Formless”Tomar was a former teammate of of Kumawat and had spoken to OpTic. This was not the case and are sorry for the error.